You should be so lucky to get an invitation to dinner at the Pecous’. Inside a turn-of-the-century stone building, you’ll find a former post office converted into a loft, with soaring ceilings and concrete walls aged to a glorious patina. As for the hosts—a vegan chef to the stars and one of Atlanta’s most compelling visual artists—they’re just as fascinating as their space. Fahamu Pecou, who received his Ph.D. from Emory University’s Institute for the Liberal Arts in May, explores black male identity through the prism of fine art. His paintings, bold and beautiful and blinged out, have appeared on set in Empire and Black-ish, as well as in solo shows in a dozen U.S. cities (including one at the High Museum of Art); at Art Basel, Switzerland; and in Paris. Through her work as a caterer and private chef, Jamila Crawford Pecou—a vegan for 25 years—has cooked for Dave Chappelle, Erykah Badu, and André 3000. “Her empanadas,” Fahamu says, “will change your life.” They certainly changed his: The couple got together in 2010, after Jamila catered one of Fahamu’s openings. Jamila typically works three-month private chef gigs for film-industry clients, but that doesn’t stop her from cooking at home. 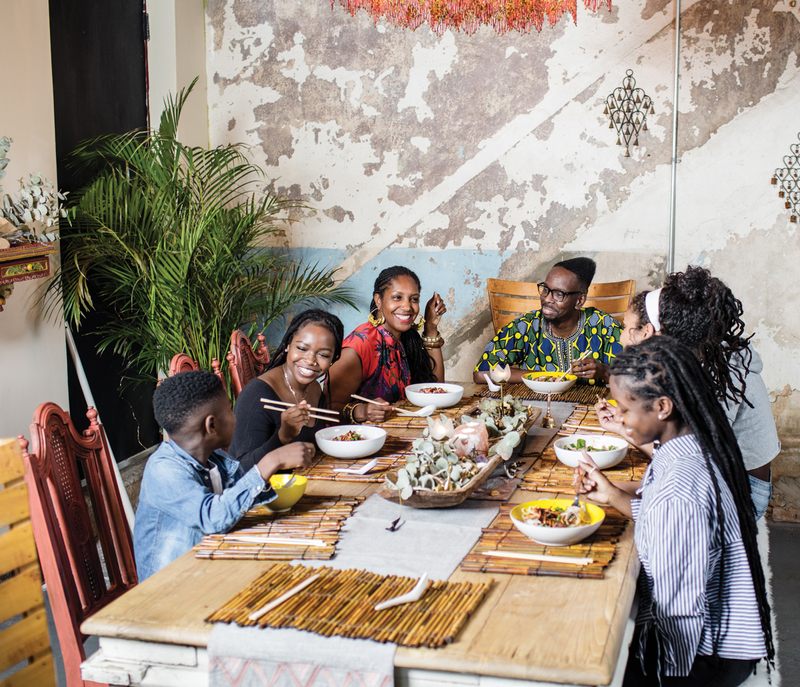 For her clients and her kids, she prepares a wide range of plant-based dishes with Caribbean, Asian, and South African influences. On this night, the blended family of four children, ages 9 to 23 (plus a niece), is politely but anxiously awaiting Jamila’s signature vegan pho. Under her supervision, they chop and prep and stir to speed things along. What’s the Pecous’ secret weapon? Hot chili oil, a dash of which goes into just about everything. But that’s not all they have in their arsenal. The secret to the depth of flavor in the pho’s broth: mushroom granules, which are like teeny-tiny umami bombs.